I just finished working on the last doll in the 2010 Coolaberation and I'm sad that the fun is over. The last doll I received is 'Onoma', a being from outer space who just happens to be suffering from amnesia. Onoma never did have a specific gender and I assume is neither or perhaps is both!! Onoma arrived pretty much complete, so it was hard to know what to add. on his/her last visit to earth. The quote I found is by Marcel Proust and reads "When nothing else subsists from the past, after the people are dead, after the things are broken and scattered, the smell and taste of things remain poised a long time, like souls, bearing resiliently, on tine and almost impalpable drops of their essence, the immense edifice of memory." The reason I chose this particular quote is because the story line that goes along with Onoma states that she/he keeps smelling a particular odor which is a reminder of something just outside the memory. As I said before I'm sad to have this round robin end. It's been such a great learning experience to play with such talented artists and to have to stretch my own creativity to try to keep up with the talent this group has. A big thank you has to go to Gail who organized us and kept us on track and also to all my fellow artists who have taught me so much. Stay tuned for the great unveil of my completed doll, Anneelaw!! Also be sure to visit our group site HERE to read all about the other dolls...you won't be sorry! 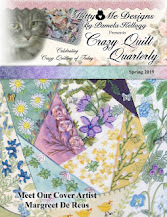 'ELEGANT CRAZY QUILT SEAM TREATMENTS'!! This volume is just as great as Volume 1 and I am happy to say I have downloaded my copy and can't wait to play with some of her wonderful charted borders. Pam says there is a third volume in the works too, and I know I'll be ordering a copy as soon as it becomes available. 1. 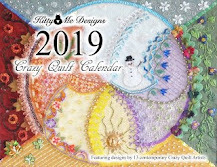 The Summer 2011 issue of Pat Winter's new magazine 'Crazy Quilt Gatherings' is now available for purchase in either a print version or a download version. If it's as good as the first issue I know it will be more than worth getting a copy! Go HERE for further details. I have mine on order and will be stalking the mailman until it comes! 2. My friend Pam Kellogg has been making some lovely cards that are available in her online shop, along with some other really lovely handmade things. Go HERE to see the latest! The baby image on the first card was one I sent her - from one of MY baby cards my parents received in 1954. 3. Our house is now on the market so we are having to live like we're in a magazine spread at all times in case we need to clear out for a showing. Not the funnest of occupations, but necessary if we plan to move. Several people have commented that we won't want to leave now that it looks so nice - hah - it's going to be a huge relief to get out from under all the WORK!!! 4. Yard sale is planned for this Saturday - anyone want to take odds on whether or not it will rain?? Proud Mother of the Groom!! Jack, Julia, RJ, Winnie, Shawn and me. may your lives be long and happy!! Do you know that old children's song that starts out with "I am slowly going crazy; slowly crazy am I going; 6-5-4-3-2-1; switch"? Called in the real estate today to start the process of selling our house and, as we feared, we were told that we would get much better offers if we were to cover up the fact that the hardwood floor in the living/dining room is worn with a nice new carpet. So, we hared down to the carpet store and picked out some cheap carpet and they will install same on Wednesday. I can hear you saying, well, what's so bad about that? What is bad about that is that new carpeting means that the quarter round has to be removed. AND, that, in turn, leads to having to repaint the baseboards....again. AND, to make matters worse, I've already thrown out my painting clothes!!!!!!!! I'm not sure this is what Julia was envisioning or even if it is going to fit but, for now, this is the veil! I'm switching gears for a little while this week and concentrating on something I love doing and that's creating something in crazy quilting! Most of you know that both our boys are getting married and one of the weddings is May 14th and I needed to get busy on the crazy quilted clutch purse I'm making for Julia. Today I sat down and actually finished it and had a totally good time doing it too! Clicking on the pictures should embiggen them for you! Now I'm on to making a birdcage veil (wish me luck).